Geologists love to find boundaries because they demonstrate the relation between different units. At a boundary you can usually identify two different rock types or geologic processes or ages. Some boundaries feather into each other and others are sharp and distinct. This boundary at the western edge of Mare Humorum looks like you could stand with one foot on each unit. The right image is an Apollo 16 oblique view looking south along the Liebig Scarp, and the left is a mosaic by KC Pau to provide context. Mare Humorum lavas appear to lap up onto (and thus are younger than) the rubbly shore between points 1 and 2 (see mouseover), but south of 2, the Liebig Scarp stopped the lava. 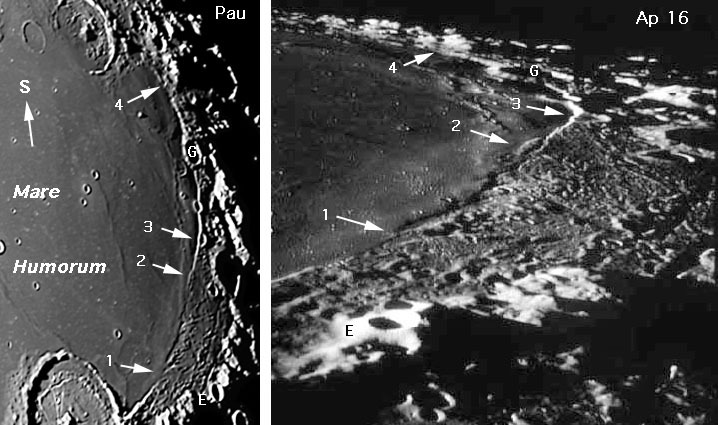 The shadow of the flow front between 1 and 2 suggests a considerable flow thickness - much more than the few tens of meters where flow fronts have been measured in Imbrium and elsewhere. 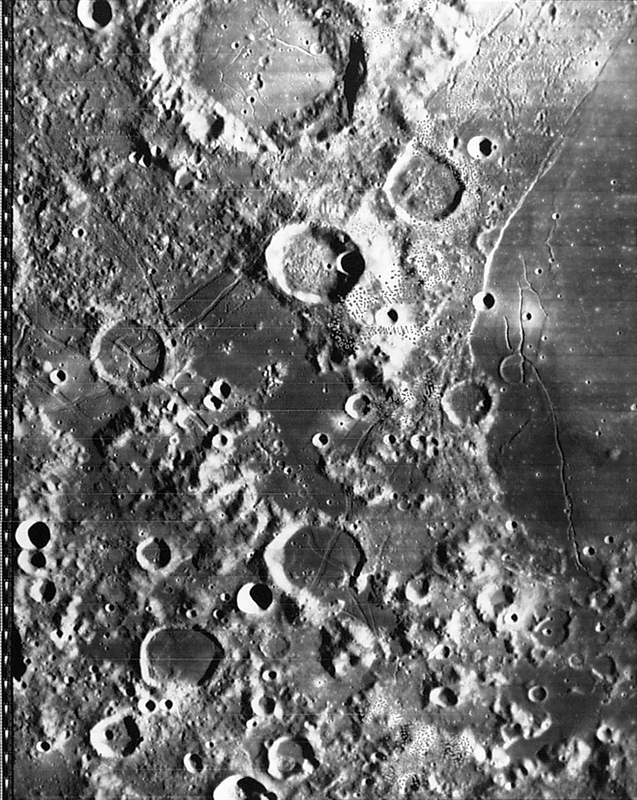 The rille-crossed and hummocky terrain to the right of the mare is perhaps similar to the Apennine Bench near Imbrium - a residual bench of the basin floor. The elongate ridge at 2 may be a high sliver of the bench that was isolated by the fault. The Apollo image provides a fine, near-profile view of the crater Liebig G, showing the relatively steep outer rim - I wouldn't want to climb that in a spacesuit! Left image: Nov 5, 2003, 10" f/6 Newtonian with 2X barlow and Philips Toucam Pro; a mosaic of 4 images. Yesterday's LPOD: A New Dome? Tomorrow's LPOD: Vaporum: Crater or Basin? This page was last modified on 20 August 2015, at 01:05.